Even though relatively few people develop a bacterial infection following a case of influenza, patients seek and get prescriptions for antibiotics which are not effective against viral infections. Overuse of antibiotics likely contributes to drug-resistant strains of diseases. These researchers used a time series modeling framework to study the relationship between influenza activity and antibiotic prescribing in the United States from 2000 to 2007. Specifically, they tracked prescriptions filled in retail pharmacies for fluoroquinolone, a broad class of antibiotics used to treat acute respiratory infections in adults. For the number of influenza patient visits they used the U.S. outpatient surveillance network for the same period. They found that the intensity of increases and decreases in influenza activity corresponded to increases and decreases in fluoroquinolone use. Focusing only on the influenza peak month (January 2004), they estimate that a 20 percent reduction in influenza activity would correlate with an 8 percent reduction in antibiotic prescriptions, roughly 141,000 prescriptions during one month. The researchers posit that if physicians know that influenza is prevalent in their community, they can refrain from prescribing antibiotics for patients who show flu-like symptoms and thereby reduce inappropriate prescribing and the risks associated with it. This study is one in a series supported by the Robert Wood Johnson Foundation’s Pioneer Portfolio to explore Extending the Cure. Extending the Cure released the three-minute, animated video below that tells the story of how antibiotic-resistant “superbug” bacteria have become a serious public health threat that affects everyone. 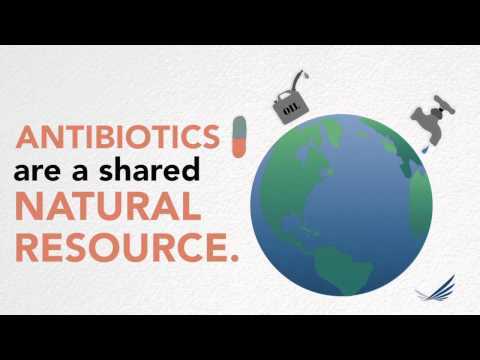 The video frames the problem uniquely: We must treat antibiotics as a natural resource that can be depleted with overuse, just like water, trees, and other resources on which we all depend. Learn about specific steps that everyone—including doctors, hospitals, and consumers—can take to tackle the problem. Extending the Cure has released a three-minute animated video that tells the story of how antibiotic-resistant “superbug” bacteria have become a serious public health threat that affects everyone. The video frames the problem uniquely: We must treat antibiotics as a natural resource that can be depleted with overuse, just like water, trees, and other resources on which we all depend. The video lays out specific steps that everyone – including doctors, hospitals, and consumers – can take to tackle the problem.